Each day, thousands of Dartmouth students enter the Class of 1953 Commons, the College’s premier “all-you-care-to-eat” dining facility. However, few may consider the behind-the-scenes action and extensive planning that goes into running ’53 Commons. According to Jon Plodzik, director of Dartmouth Dining Services, dining on campus should not solely focus on providing food to students. The opening of ’53 Commons in 2011 was made possible by a $12 million gift from more than 250 alumni in Dartmouth’s Class of 1953. The space is designed to be conducive to social gatherings. Jennifer Nakhla, ’53 Commons manager, said that the furniture in the dining hall was chosen intentionally in order to facilitate various social interactions among students. Plodzik came to Dartmouth in September of 2016 from the University of New Hampshire’s dining service. He sometimes jokes that if he didn’t believe in the importance of improving Dartmouth’s dining program he “would be in the Caribbean by now.” Plodzik is passionate about DDS and believes strongly in the program’s possibilities. While he is proud of Dartmouth’s current offerings, Plodzik emphasized that he always sees room for improvement. 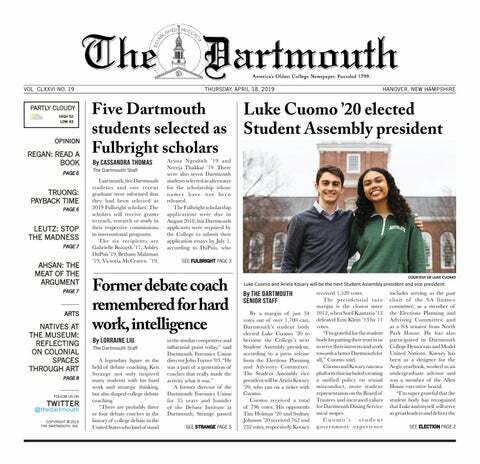 Although he likes Dartmouth’s “all-you-care-to-eat” system in ’53 Commons, he hopes to make the program even more accessible by phasing out meal periods and allowing the dining hall to stay open throughout the day, among other changes. Prior to the “all-you-care-to-eat” program’s inception, Plodzik said that Dartmouth had an à la carte plan in which students had to buy food items individually at each of Dartmouth’s cafés and dining facilities. Plodzik views the Class of ’53 Commons’ “all-you-care-to-eat” dining service as “an equalizer,” as it ensures students have equal access to food at Dartmouth regardless of their economic means. Similarly, Nakhla sees improving the dining options and listening to student feedback as DDS’s “greatest priority.” She monitors the “thought box,” a box in which students can submit feedback and concerns, and also hosts a Student Advisory Committee meeting each term in Paganucci Lounge. According to Plodzik, the purpose of the Student Advisory Committee is to “gain global feedback” and “talk about big ideas” regarding the future of Dartmouth Dining Services. Plodzik said that some topics under discussion are modifying meal plan offerings, changing the structures of grilling stations around campus and possibly implementing a food vending facility at the soon-to-be-constructed Irving Institute for Energy and Society. Nakhla said that her favorite aspects of her position as a manager are having the abilities to work alongside her colleagues and improve students’ dining experiences when they enter the Class of ’53 Commons. However, Nakhla’s role at the Class of ’53 Commons does come with some challenges. Nakhla meets with her employees each day before their shift begins in order to facilitate communication and comradery. Alexandra Mena ’20, who worked at the Class of’53 Commons during her freshman spring and sophomore fall before deciding to pursue other opportunities, agrees that Nakhla and the other supervisors strove to create a positive working environment. While employed for DDS, Mena scheduled her shifts on Fridays, Saturdays and Sundays because it coincided best with her academic schedule. A typical day for her would consist of arriving at 6 p.m. and working until 10 or 10:30 p.m.. After arriving at work, Mena would generally clock in, put on her gloves and work in the dish room. Mena appreciated the positive working environment, the higher-than-average student wages and the frequent opportunities to earn overtime. However, she admitted that she found the position to be “tiring and more labor-intensive than anticipated,” especially during the “peak times” between 6:30 and 7:30 p.m. Despite its challenges, Mena believes the position strengthened her character and workplace skills. Mena will continue to cherish the friendships that she made with her coworkers in ’53 Commons during the two terms that she spent working there.